Hope you are well. Exciting news ! This month I am on tour in Poland and Luxembourg. This November 2017 I am performing a special series of concerts called 'The Ribbon of memory Tour - Wstega Pamieci Tour 2017' which is dedicated to Independence Day in Poland and Remembrance Day in GB and in honour of all those who have fought for an Independent Poland over the centuries. The Wstega Pamieci Tour concerts take place in Poland with performances in Krakow, Wroclaw and Warsaw and at the Ancien Cinema in Luxembourg and honour the 75th Anniversary of the inauguration of the Polish Home Army (1942- 2017) the Polish Home Army Veterans who initiated the Polish Resistance Memorial - Wstega Pamieci Project which will be opened at the foot of the Wawel in Krakow in May 2017. 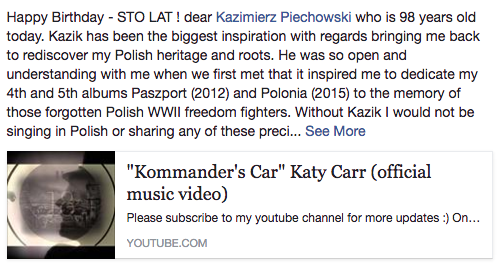 Expect to hear songs from Katy's Paszport (2012) and Polonia albums (2015) inspired by great Polish patriots as well as Polish patriotic songs such as Dziś do ciebie przyjść nie mogę and Biale roze. You are all welcome and invited ! 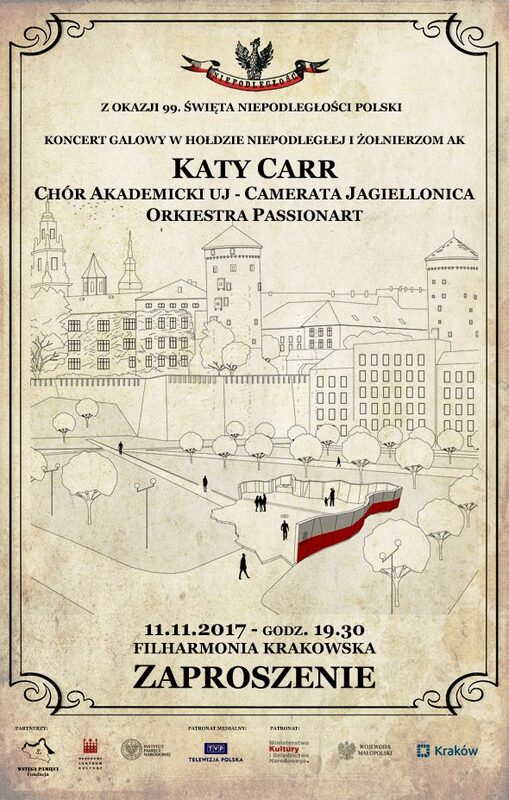 6th Nov 2017 - 19:00 : Aula Jagiellońska, Collegium Maius, Jagiellonian University, ul Jagiellońska 15, 31-010 Kraków, in honour of the Polish Professors who were transported to Sachsenhausen concentration camp for extermination in Germany at the beginning of WWII. This concert will honour the Polish intellectual elite who under the 'Sonderaktion Krakau' were exterminated by the Germans at the beginning of World War II. During the German occupation of Poland the 'Intelligenzaktion,' was a plan created by Germany to eradicate the Polish intellectual elite and intelligentsia. Invitation only. 11th November 2017 : 19:00 : Filharmonia Krakowska im. Karola Szymanowskiego, Zwierzyniecka 1, 31-103 Kraków, Poland in honour of Independence Day in Poland and Remembrance Day (GB) to commemorate the efforts of the Freedom Fighters who fought for an Independent Poland across the centuries. This special concert event is in partnership with the Ribbon of Memory Foundation, the City of Krakow and the Narodowe Centrum Kultury. 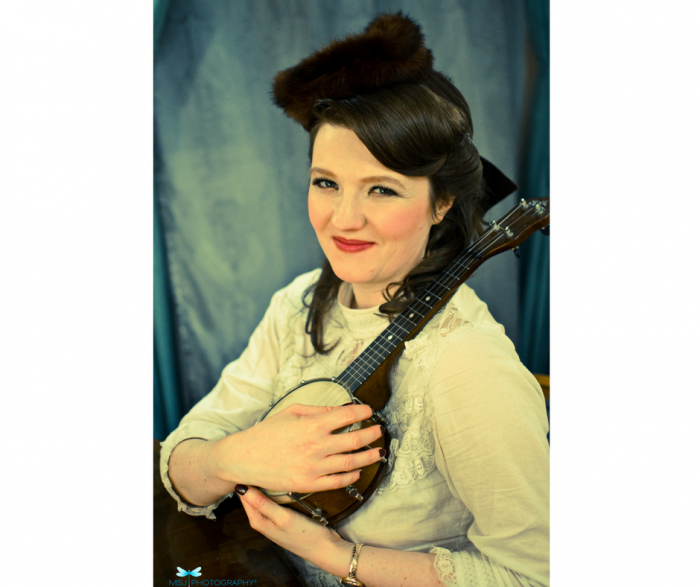 Katy Carr will perform songs she has written with the PassionArt orchestra with over 150 musicians who are based in Krakow. 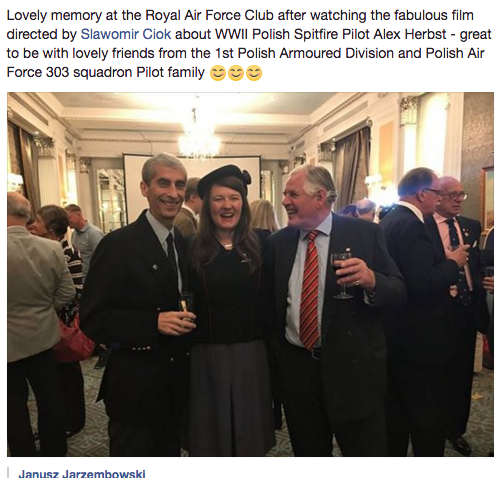 SEPT 2017 : At the Polish Air Force Memorial , RAF Northolt London. A message from Alexander Smaga, architect of the Polish Resistance Memorial in Krakow. 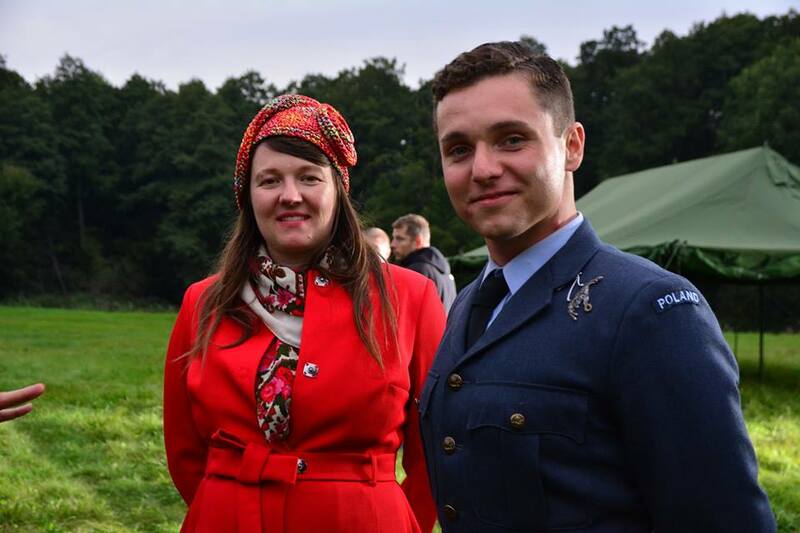 'It was a great pleasure and honour for me to be given the chance to participate in the special ceremony to honour the pilots of the Polish Air Force (25,000 airmen) who were flying under British command during WW2 in an event which took place at the memorial of the Polish Air Force at RAF Northolt on 2nd of September 2017. 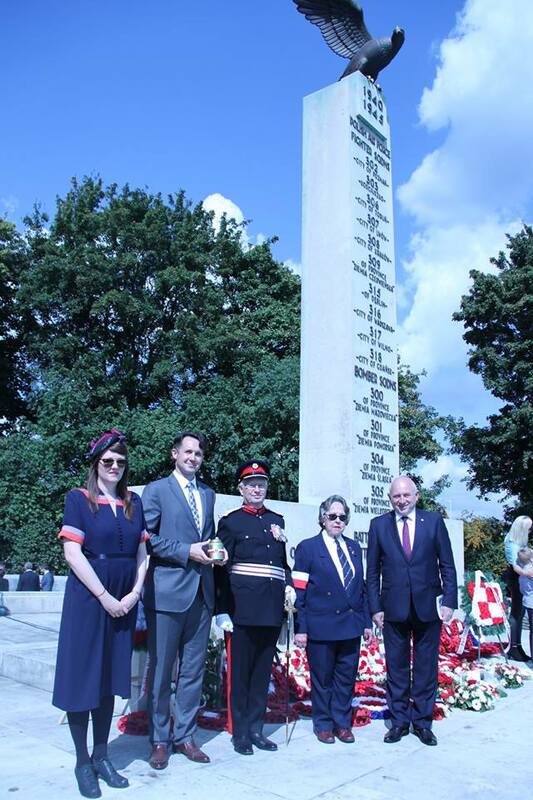 In order to commemorate the Polish and Allied pilots who flew risky air missions to occupied Poland during WW2 some special soil from the memorial at RAF Northolt was taken which will be added to the foundations of Polands Resistance memorial at the foot of the Royal castle in Krakow. 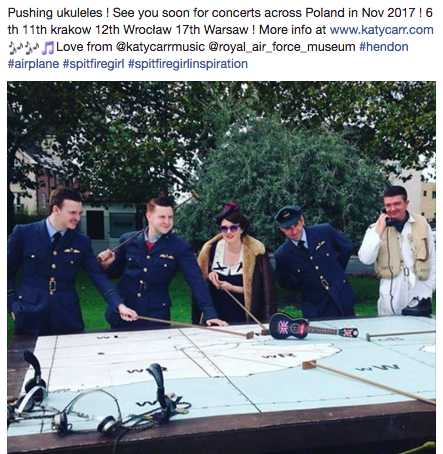 Katy Carr performed at this year’s Battle of Britain and the Polish Air Force Involvement in WWII commemoration event at the Ulster Aviation Society exhibition centre in Lisburn, Northern Ireland. With a unique collection of over 30 heritage and modern aircrafts, including airplanes, helicopters and aviation artefacts, this place is home to Northern Ireland’s aerial history and was a perfect location to discover the role of the Polish Air Force in the Battle of Britain and to see Katy perform. 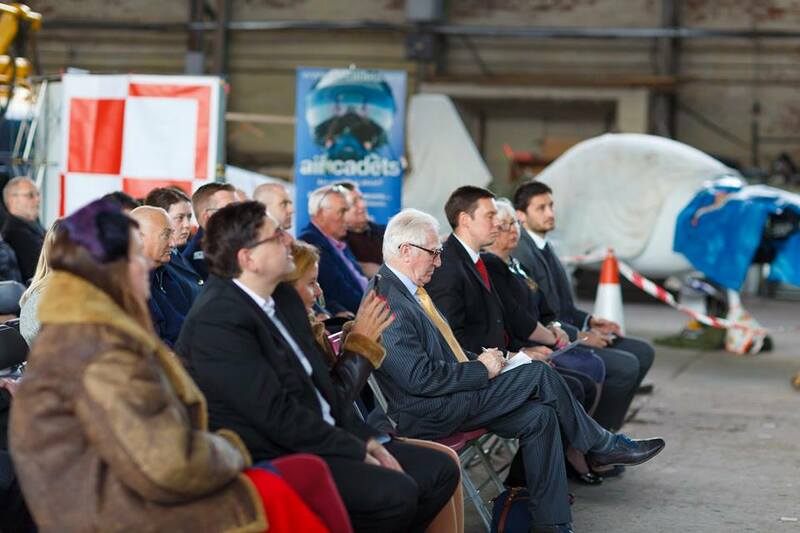 With Big thanks to For Your Freedom and Ours Foundation, Maciek Bator and the Polish Consul for securing funding for this event. 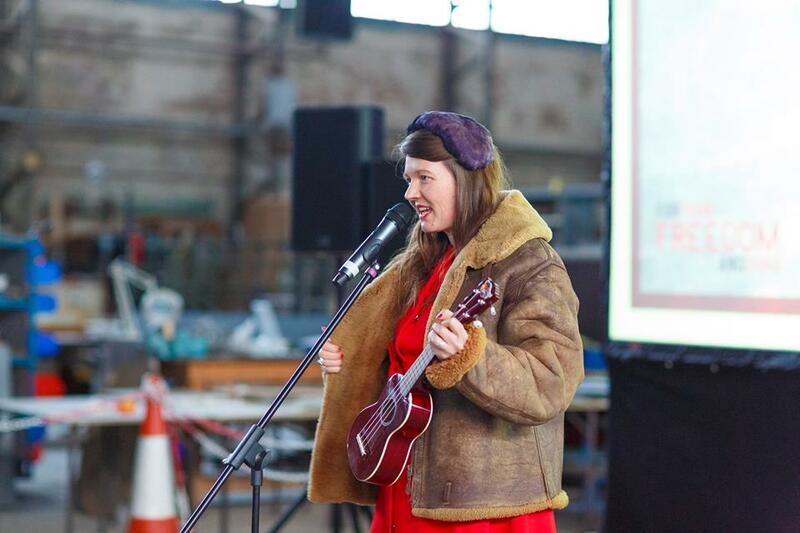 Below Katy Carr performs in a jacket worn by Captain Frederick Michael Alexander Torrens-Spence DSO, DSC, AFC (10 March 1914 – 12 December 2001) who was a Royal Navy Fleet Air Arm pilot in the Second World War. Torrens-Spence earned the distinction of holding commissions in the Royal Navy, the Royal Air Force, the British Army and the Royal Ulster Constabulary. 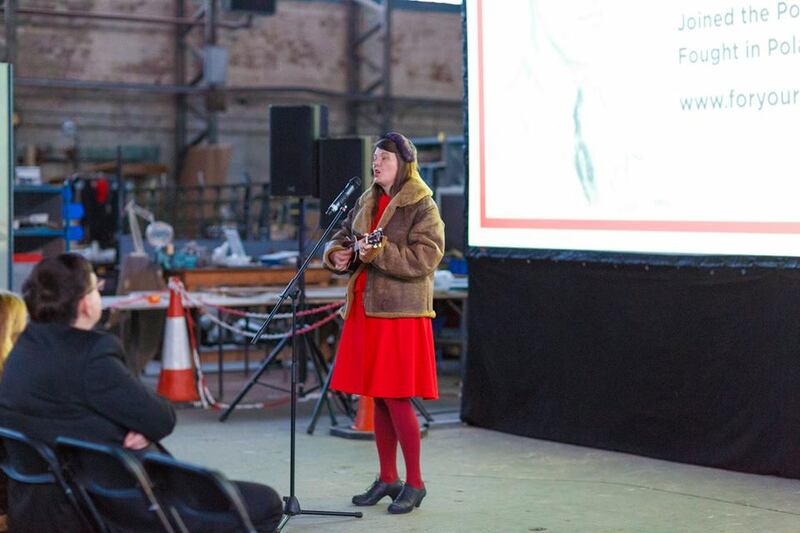 Katy was kindly given the jacket to wear as it was freezing in the hangar and it certainly gave an atmosphere to the performance. Below Katy with the local Air Cadets reminding her of her days of an Air Cadet :) With Maciek Bator, Jerome Mullen, Graham Dodds, Katy Carr, Maria Golasowska and Tony Osborne. Watching the screening of the Spitfire: The Alex Herbst Story followed by a Q&A session with the documentary director, Slawomir Ciok. 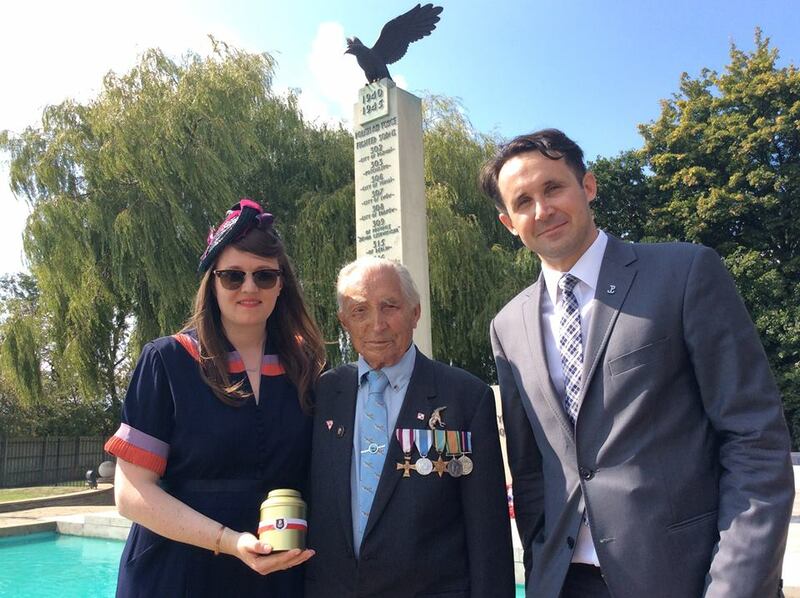 WWII fighter pilot Alex Herbst – pilot from the Polish Air Force 303 & 308 RAF squadrons. On the film set of the film about the 303 Polish Air Force Division Pilots just outside Warsaw in Poland. 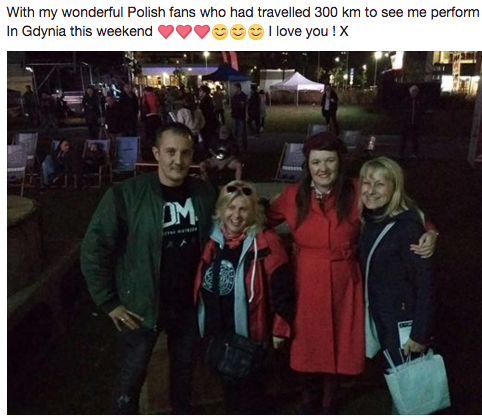 Foto below : AFTER KATY'S CONCERT AT The Festiwal NNW – Festiwal Niepokorni Niezłomni Wyklęci in Gdynia, Poland late September. STO LAT KAZIK - Dziś 98 urodziny obchodzi pan Kazimierz Piechowski - ostatni żyjący uczestnik brawurowej ucieczki z KL Auschwitz, która miała miejsce 20 czerwca 1942 roku. Tego dnia między godziną 15.00 a 16.00 zbiegło z KL Auschwitz 4 Polaków, zatrudnionych w garażu Truppen-Wirtschafts-Lager (TWL): Kazimierz Piechowski (nr 918), Józef Lempart (nr 3419). Stanisław Gustaw Jaster (nr 6438) i Eugeniusz Bendera (nr 8502). Trzech więźniów było przebranych w uniformy SS, jeden jako Oberscharführer w czapce z daszkiem, dwaj w stalowych hełmach z karabinami, czwarty skuty kajdankami jako więzień. Opuścili obóz wyjeżdżając autem PKW (Steyer Typ 220 nr SS-20868) z garażu TWL. W odległości 80 km od obozu, w lesie w Suchej k. Żywca, zniszczyli auto i pozostawili w rowie. Po szczęśliwie udanej ucieczce przesłali do komendanta obozu ironiczny list z przeprosinami za pozbawienie go samochodu. Swoje losy w niemieckim obozie koncentracyjnym Auschwitz opisał w książce „Byłem numerem... historie z Auschwitz”. Kazimierz Piechowski jest również głównym bohaterem filmu dokumentalnego pt. ,,Uciekinier''. Even though you only lived in Poland for the first few years of your life, this experience has obviously had a great impact on you. 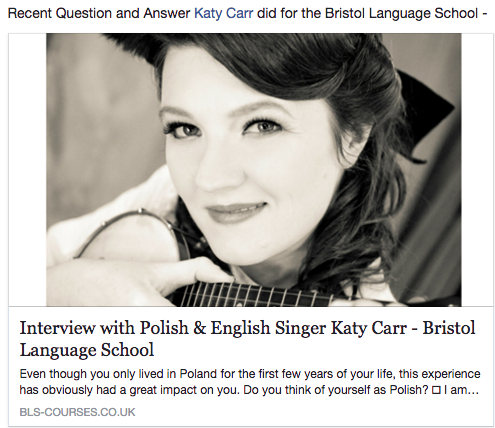 Do you think of yourself as Polish? I am very proud to have Polish blood and so pleased that my Polish heritage has become a huge inspiration for my music and creativity. Poland and Polish people worldwide are my inspiration and I never want to be separated from them for such a long period ever again. I loved writing my albums Paszport and Polonia and I look forward to more Polish inspired musical projects. In what ways, do you think this dual identity has enriched you? Are there any disadvantages? I love being British and Polish and I see only happiness from being enriched by two nations. I have two sets of heritage to draw upon for my musical creativity and this only adds not only to the richness of my own life experience but also to my audiences. Sharing the wealth of knowledge and the friendship between Great Britain and Poland is my huge passion. I look forward to meeting many more people through my music in the forthcoming years. Where did the idea of singing in Polish come from? Does it help you reconnect with your heritage? I started my rediscovery of Poland through writing a song called Kommander’s Car about the infamous escape of Kazik Piechowski, Polish boy scout from Auschwitz on June 20th 1942. 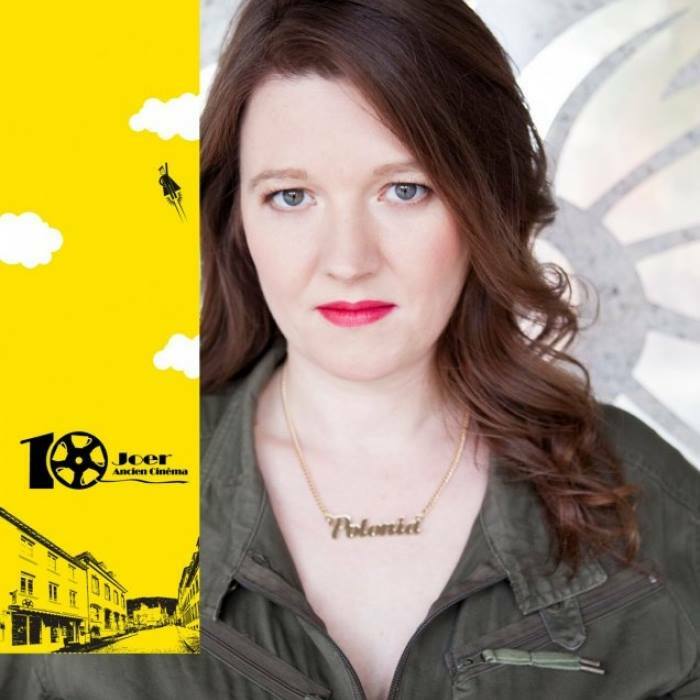 When I wrote my song, I was desperate to make links with my Polish heritage but it was very difficult to make a connection. It is only through my music that I came to gain access to the Polish People and Poland that I know today. I owe everything to my music and songs that helped me carve a route to discover and share the rich and diverse history of Poland which is a wonderful and glorious nation. 20th June 1942 – 20th June 2017 marks Kazik’s 75th Anniversary of his escape. You tour both in the UK and in Poland. Do you notice a difference between the audiences? Do you have a preference? I love performing to all audiences worldwide. Recently I have visited the countries that gave refuge to the exiled Polish community after WWII. Poland was the only Allied nation to fall behind the Iron Curtain. Poles in these circumstances were not given access to Poland and were known as ‘Aliens’ – exempt from ever entering Poland again – mainly because Poland had been given over to Totalitarian Communist Rule after the Yalta Conference meeting of Hitler, Stalin and Churchill in February 1945- known as the Western Betrayal of Poland. The outcomes of the conference were kept secret but it meant many hundreds of thousands of Allied Polish military troops were left without homes after WWII. I named my recent album after the brave people of Polonia – the Latin name for Poland and dedicated it to friendship between Polish pianist and composer (later President of Poland 1919) Ignacy Paderewski and Sir Edward Elgar – the English composer who wrote a Symphonic Prelude called ‘Polonia’ dedicated to raising money for the Poles who were without a country in 1915. (Poland was erased off the map of Europe between 1795 and 1918). We are very impressed with your knowledge of Polish history! Would you say that being away from your country of origin has actually made you more patriotic and interested in the nation’s past? History does matter as learning about it can hopefully help future generations learn from the mistakes of the past. Unfortunately history does repeat itself and we as human beings on this little water planet continue to engage in wars and gross cruelty and suffering today which in my opinion is completely unacceptable especially during the 21st Century, which is supposed to be the age of Light. I weep at the idea that children and families are starving from hunger everyday or who are enslaved in cruelty across the planet. I would say that learning about Poland’s past has encouraged me to make connections with other communities and nations to help people worldwide raise their confidence and realise their dreams. My dream is to make people happy through my music and I hope I continue to do so for many years to come. 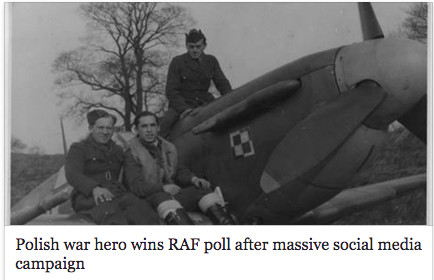 Franciszek Kornicki, the Polish pilot who took command of 308 Squadron during the Second World War has been named the winner of an RAF Museum poll to decide 'The People's Spitfire Pilot'. 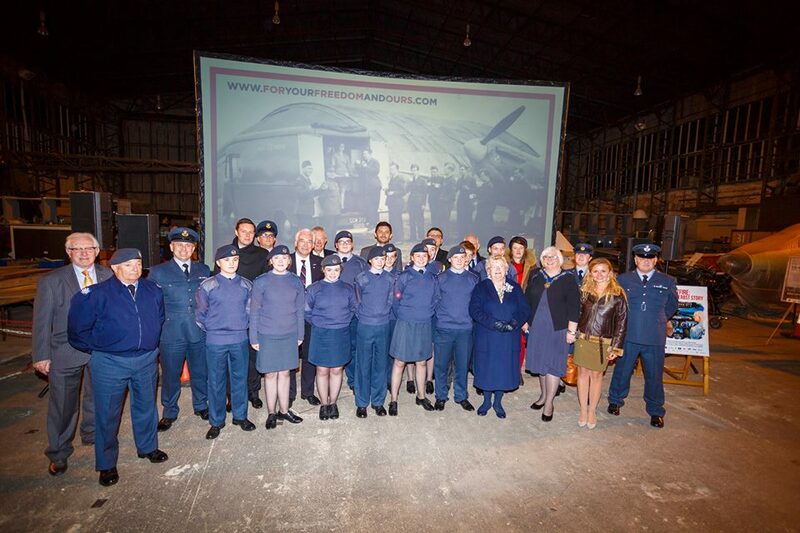 The poll, which was hosted by The Telegraph, was set up to celebrate 100 years of the Royal Air Force in 2018. 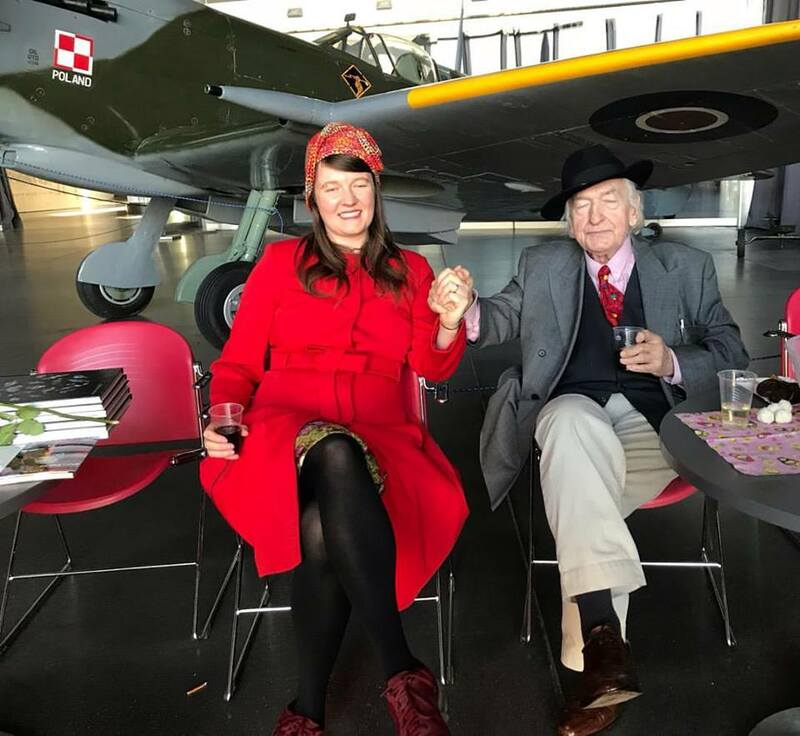 A life-sized display of Kornicki and his story will now adorn the RAF Museum's centenary exhibition, standing alongside the iconic Spitfire VB BL614. Kornicki fought in the No. 308 "City of Kraków" Polish Fighter Squadron RAF (Polish: 308 Dywizjon Myśliwski "Krakowski") was a Polish fighter squadron formed in Great Britain as part of an agreement between the Polish Government in Exile and the United Kingdom in 1940. It was one of several Polish fighter squadrons fighting alongside the Royal Air Force during World War II. THANK YOU SO MUCH TO HELEN MCCOOKERYBOOK FOR THIS WONDERFUL ARTICLE ! (ur. 26 marca 1936 w Sokalu) – polski piosenkarz i aktor, artysta Piwnicy pod Baranami. Little is known outside Poland of the Polish Home Army's incredible achievements, history and bravery and the fact that they became the largest Underground Resistance movement during WWII. This was due mainly to the way the history of Poland was shared post WWII during the time of the Iron Curtain and the Cold War . Responsible for over 300,000 military professionals the Polish Home Army's incredible contribution for justice and humanity was unrivalled during WWII even though all of it's activity remained underground. The operations of the Polish Home Army included a vast web of activities including substantial military offences and actions, a professional legal law system, education and universities to continue Polish heritage, Zegota for the rescue of Jews in occupied Poland and countless other military initiatives like the Polish Elite Parachute Regiment - the Cichocemni trained in Great Britain during WWII. Some historians argue that over two million Poles were involved with Armia Krajowa activities during WWII whilst some go further in number to argue that the whole of occupied Poland took part in resistance activities- not forgetting the many foreign fighters who also fought alongside and the Polish Home Army including American, Canadian, African, Asian and European military personnel. 'Kommander's Car' in honour of Katy Carr's biggest muse in Poland Kazimierz Piechowski who escaped from Auschwitz in the Commandant's car 75 years ago in 1942. W listopadzie 2017 roku brytyjska wokalistka, multiinstrumentalistka Katy Carr, artystka z polskimi korzeniami, występuje w cyklu koncertów o wspólnej nazwie Wstęga Pamięci Tour 2017, zadedykowanych „W hołdzie Niepodległej i żołnierzom AK”. Koncerty te poświęcone są tym wszystkim, którzy bohatersko walczyli o niepodległość i wolność Polski. Rok 2018 to setna rocznica odzyskania niepodległości przez Polskę. Katy Carr jest artystką wielokrotnie nagrodzoną na polu artystycznym, z dorobkiem 6 albumów płytowych. Za pośrednictwem swojej muzyki stała się ona ambasadorką polskiej historii. Jej ostatnie albumy płytowe to Paszport(2012) i Polonia(2015), inspirowane wydarzeniami historycznymi, tragedią Polaków w okresie II wojny światowej.W swojej twórczości artystycznej Katy Carr zainspirowała się z pasją historią Polski i dzięki swojej myzyce z oddaniem kultywuje przyjaźń pomiędzy Wielką Brytanią i Polską. W 2015 roku Katy Carr została nagrodzona honorowym członkostwem Pierwszej Polskiej Dywizji Pancernej. Za swój dorobek muzyczny i humanitaryzm została uhonorowana w 2016 roku medalem „Pro Patria”. W roku 2017 Katy Carr rozpoczyna cykl koncertów w ramach ”Wstęga Pamięci Tour 2017” występami w Krakowie, Wrocławiu, Warszawie oraz w Luxemburgu . Cykl koncertow z solowym udziałem brytyjskiej artystki stanowi także hołd z okazji 75. rocznicy powstania Armii Krajowej, oddając cześć weteranom i kombatantom a w szczególności inicjatorom idei powstania pomnika AK w Krakowie. Pomnik AK to szczególny testament pokolenia kombatantów AK, dzieło architektoniczno-rzeźbiarskie projektu Alexandra Smagi, które zostanie odsłonięte w maju 2018 roku i stanie u stóp Wawelu. Koncerty „Wstęga Pamięci Tour” mają podkreślić i zwrócić uwagę na nieustanną wielką przyjaźń między dwoma aliantami II wojny śwatowej, przyjaciółmi nie tylko na polu bitwy ale i kultury, muzyki, nauki , jakimi stały się Wielka Brytania i Polska na przestrzeni stuleci. ...”Jestem zaszczycona, że mogę wystąpić w cyklu Wstęga Pamięci Tour 2017 i zaśpiewać w hołdzie wielkim bohaterom i bohaterkom walczącym o wolność i niepodległość Polski. Popieram gorąco koncept tego cyklu, który powstał aby uhonorować i podkreślić ciągłość historyczną walk o odzyskanie ojczyzny wolnej. Wiemy, że Polska przez 123 lata zniknęła z mapy świata od 1795- 1918 roku, cierpiąc wpierw pod zaborami obcych mocarstw a póżniej pod okupacją niemiecką i radziecką. Podczas koncertów usłyszą Państwo piosenki z albumu Paszport i Polonia inspirowane postaciami największych polskich patriotów oraz poskimi pieśniami jak np. „Dziś do ciebie przyjść nie mogę” , „Biała róża” i inne.Armia Krajowa to największa armia Polskiego Państwa Podziemnego w Europie, licząca ponad 300 tysięcy żołnierzy. Jej osiągnięcia na polu walki II wojny światowej, postaci dowódców, bohaterskich żołnierzy, jednostka Cichociemnych, działalność na zasadzie struktury tajnej i podziemnej to niezbite fakty historyczne, słabo znane poza granicami Polski. Niewiele osób, poza Polakami, może sobie wyobrazić, że Polska mimo okupacji niemieckiej, dzięki utworzeniu Polskiego Państwa Podziemnego, miała własny rząd, armię, struktury państwowe, edukacyjne takie jak szkoły i uniwersytety, prawodawstwo,organizacje pomocy Żydom oraz Żegota-specjalna organizacja poświęcona ochronie Żdów. Nieznajomość tego okresu historii Polski przez cudzoziemców wynika z tego, że Polska po 1945 roku na mocy Paktu w Jałcie znalazła się za tzw. Żelazną Kurtyną i przeszła w strefę ZSRR, tracąc swoje przedwojenne ziemie i granice. Niektórzy historycy uznają, że z AK współpracowało ponad 2 mln ludzi, inni przyjmują tezę, że cała Polska brała udział pomagając AK w walce z dwoma okupantami. Nie zapomnijmy, że do szeregów konspiracyjnej, podziemnej armii dołączyło także wielu cudzoziemców z USA, Kanady, Afryki, a nawet z Azji. Z tych względów, cykl koncertów „Wstęga Pamięci Tour 2017”, inicjatywa Fundacji Wstęga Pamięci – Ribbon of Memory, jest niezwykle ważnym przedsięwzięciem dla upamiętnienia bohaterów Armii Krajowej, kontynuatorów idei niepodległościowej w walce o odzyskanie wolności przez Polskę. Tytuł utworu muzycznego Polonia pochodzi od gestu oddania i lojalności Sir Edwarda Elgara w stosunku do swojego bliskiego przyjaciela, kompozytora, późniejszego prezydenta Polski, Ignacego Paderewskiego (GBE – Rycerza Wielkiego Krzyża Orderu Imperium Brytyjskiego) i polskiego Orderu Orła Białego. Elgar napisał swój utwór pt. Polonia w 1915 roku, dokładnie 100 lat temu, z myślą o Funduszu Na Rzecz Polskich Ofiar (Polish Victims Relief Fund). 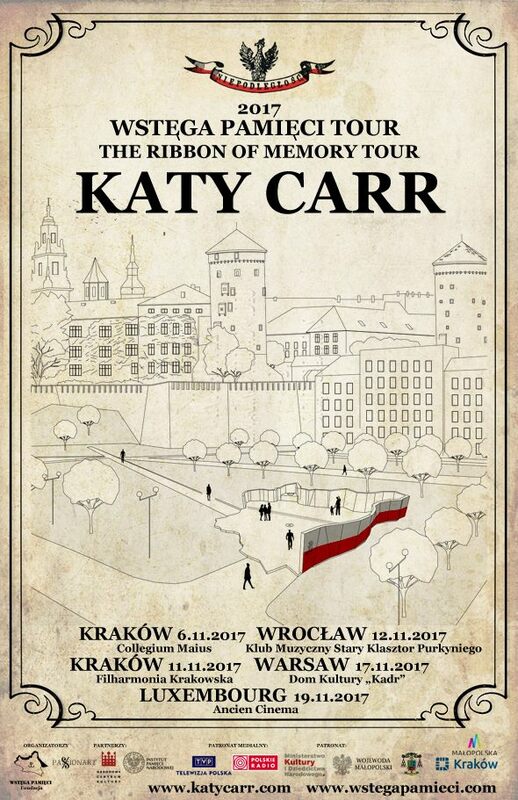 Utwory na albumie CD Katy Carr „Polonia” opisują wyczyny i sylwetki wielkich polskich bohaterów walczących za wolność oraz budujących przyjaźń polsko-brytyjską. „Mala Little Flower” -„Mała” to pseudonim Ireny Gut Opdyke w Armii Krajowej, która została upamiętniona i uhonorowana za ratowanie Żydów w Yad Vashem jako jedna ze Sprawiedliwych pośród Narodów. “Jumping with Zo” - (Skacząc z Zo), poświęcona gen. Elżbiecie Zawackiej , jedynej kobiecie skaczącej do Polski jako Cichociemna „w niebo tak ciemne”. Melodia ta zawiera małą aluzję do „Hejnału," tradycyjnego, polskiego narodowego muzycznego symbolu Polski, granego co godzinę z wieży Kościoła Mariackiego Krakowie, w na trąbce, na cztery strony świata. „Motylek ”– inspiracją byli piloci Polskich Sił Powietrznych, którzy walczyli u boku angielskich pilotów w szeregach RAF, a szczególności postaci gen. Skalskiego, pilotek Jadwigi Piłsudskiej i Anny Leskiej oraz sam Dywizjon 303 . Piodenks dla upamiętnienia pilotów Polskich Sił Powietrznych, którzy walczyli u boku Królewskich Sił Powietrznych w Bitwie o Wielką Brytanię podczas II wojny światowej. „Wojtek” – to ukłon dla Niedźwiedzia Wojtka, żołnierza w Armii gen. W. Andersa, II Korpusu, który walczył pod Monte Cassino. „Kommander's Car' “ piosenka powstała w wyrazie podziwu i szacunku dla Kazimierza Piechowskiego, który uciekł 75 lat temu w 1942 r. z niemieckiego obozu koncentracyjnego Auschwitz, samochodem komendanta obozu. Brawurowa ucieczka Kazimierza Piechowskiego oraz sam bohater stał się muzą dla Katy Carr. Singiel „Kommander’s Car” z płyty „Paszport” został zainspirowany ostatnim 80 metrowym odcinkiem ucieczki z obozu koncentracyjnego Auschwitz, Piechowskiego i oraz jego kolegów, przebranych w mundury SS. Wyjechali z obozu w ukradzionym samochodzie komendanta Rudolpha Hössa w czerwcu 1942 roku. Polonia, piąta płyta Katy Carr, powstała pod wpływem inspiracji zagadnieniami słabo zbadanymi przez zachodnich historyków, jak front wschodni II wojny światowej i potężna siła militarna walczących o wolność Polski. Piosenki Carr znajdujące się na płycie Polonia odkrywają tych samych ludzi, którzy w czasie II wojny światowej walczyli nie tylko o niepodległą Polskę, ale i o wolność Zachodu, zwłaszcza Wielkiej Brytanii. Polska była nie tylko jedynym sojusznikiem Wielkiej Brytanii przez pierwsze dwa lata wojny oraz drugą po USA największą militarną siłą koalicyjną pod koniec II wojny światowej. Artystka nagrała do tej pory 5 albumów – „Screwing Lies” (2001), „Passion Play” (2003), „Coquette” (2009), „Paszport” (2012), „Polonia” (2015). Thanks again for all your support of my music and keep in touch and take care - see you soon! 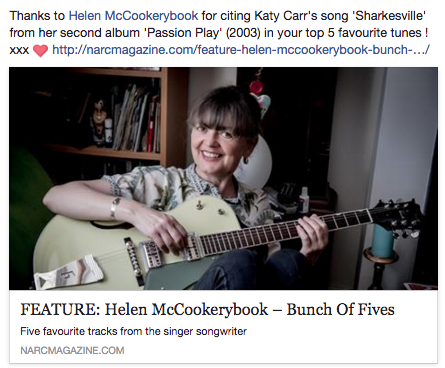 Katy Carr is an award winning British recording artist and has released 6 albums. 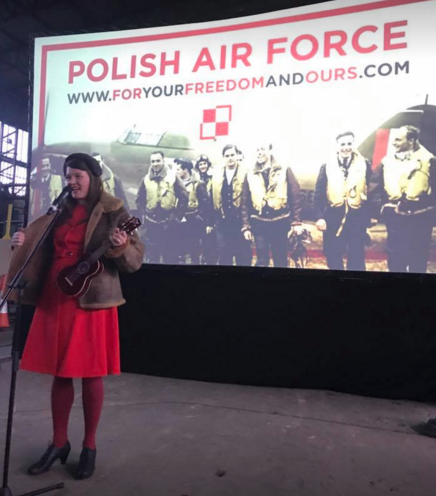 An Ambassador of Polish history in Great Britain, her recent albums Paszport (2012), ‘Polonia' (2015) are inspired by the Polish WWII experience. In 2016 Katy was awarded the Pro Patria medal for her humanitarian and musical work. 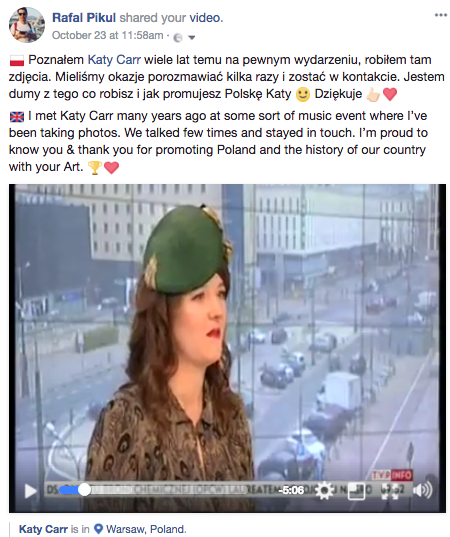 Katy Carr jest brytyjski artysta z polskiego korzenie.An Ambasadora historii Polski w Wielkiej Brytanii, jej albumy Paszportu ( 2012 ), " Polonia " ( 2015 ) są inspirowane przez doświadczenie Polski WWII . W 2016 roku został odznaczony Katy Pro Patria medal za pracę humanitarną i muzycznej. 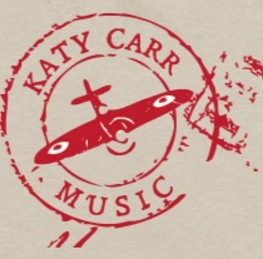 Katy Carr Links below - please keep in touch!!! !